Curly Cocktails™ come with these wonderful recipe cards to help you get just the right look. There’s no denying that curlies use products in a different way than people with other hair types. Curly girls have become makeshift chemists, creating their own concoctions of gels, mousses, serums, mousses and pomades, customizing them to the unique needs of their curls and kinks. In October 2007, we launched Curly Cocktails™ — a collection of seven intoxicating styling offerings tailored for specific curl types. 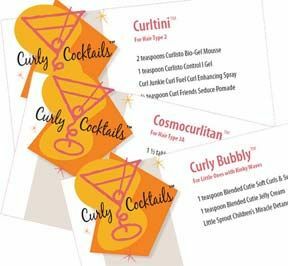 They include the adult cocktails Curltini™, Cosmocurlitan™, Curl & Tonic™, Curlaccino™ and Hot Buttered Curls™ as well as the Curly Temple™ and Curly Bubbly™ for children’s curls and kinks. Each cocktail was created using input from our loyal curlies, and contains a customized combination of your “Holy Grail” products. They come specially packaged with a range of three to five products, a recipe card and a wide-toothed comb. Diedre Boone, owner of The Root of You Salon and Day Spa in Houston says women with curls and kinks have such a wide variety of hair types and one product rarely does the trick. “The fact that their hair textures vary so dramatically, we find it necessary to mix together different products on different people,” Boone says. In addition to offering up our new cocktails, we are kicking off our “Create Your Own Curly Cocktail™” contest during the month of October. Readers are invited to submit their own cocktails, and the winning creation will be announced in NaturallyCurly’s Nov. 20 online newsletters as well as on the NaturallyCurly site. Readers are allowed two options: create a cocktail using products available in CurlMart or create a cocktail using any products of their choosing, whether they be salon brands or drugstore offerings. Winners will be selected for each option, and each will receive a $50 CurlMart gift certificate.